Home News P02 COP OWNS A HOUSE THAT FITS FOR A GENERAL, P7M CASH FOUND IN HIS "CAJA DE YERO"
This was according to the government agents who arrested Aliangan last 25 May 2016 after finding about PhP 7 million in cash and a hefty stash of “shabu” at his well-furnished home in Manila. The NBI (National Bureau of Investigation) said that the drugs were allegedly supplied by a syndicate still being run by a drug lord who was already convicted and serving time. Aliangan, an antinarcotics officer who reports to the National Capital Region Police Office, was also tagged by the NBI as a “reseller” of drugs that were earlier confiscated in police operations. Salvador declined to identify the drug lord but said he was one of the 19 convicts who were briefly moved out of Bilibid and held at the National Bureau of Investigation headquarters late last year following the raids conducted by the bureau on the lavish quarters enjoyed by the so-called VIP prisoners. Also placed under arrest was Aliangan’s wife, Ronalie, who the National Bureau of Investigation said was caught flushing several kilos of shabu down the toilet during the raid. The bureau has yet to determine the exact amount of the drug found in the household at press time. 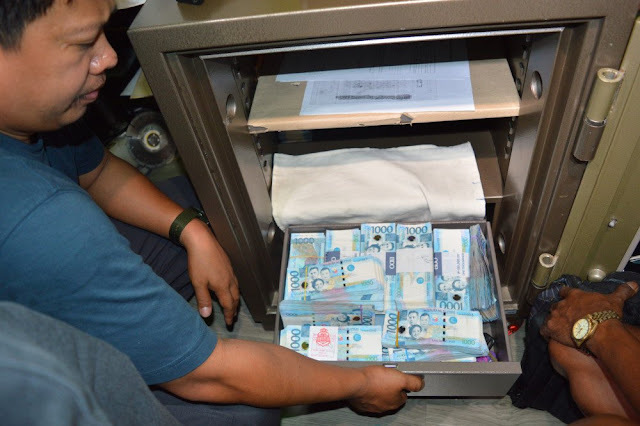 National Bureau of Investigation-National Capital Region deputy chief Rommel Vallejo said his men had placed Aliangan’s three-story house under surveillance for three months before obtaining a search warrant. “It looked as if it belonged to a general, not someone of his rank. You’ll be surprised at the high-end furniture,” Vallejo said. A Police Officer 2 like Aliangan earns about PhP23,000 a month. The house was also equipped with several security cameras monitoring its perimeter. Parked behind the tall black gate were two new vehicles: a Toyota Altis and a Fortuner. The NBI said several firearms, fake license plates and a few more sachets of shabu were also found inside the two vehicles. Salvador said the bureau had received reports that Aliangan was just one of the “movers” working for convicted drug lords. Vallejo added that the arrested officer served as a distributor in the Sampaloc area and other parts of the metropolis.